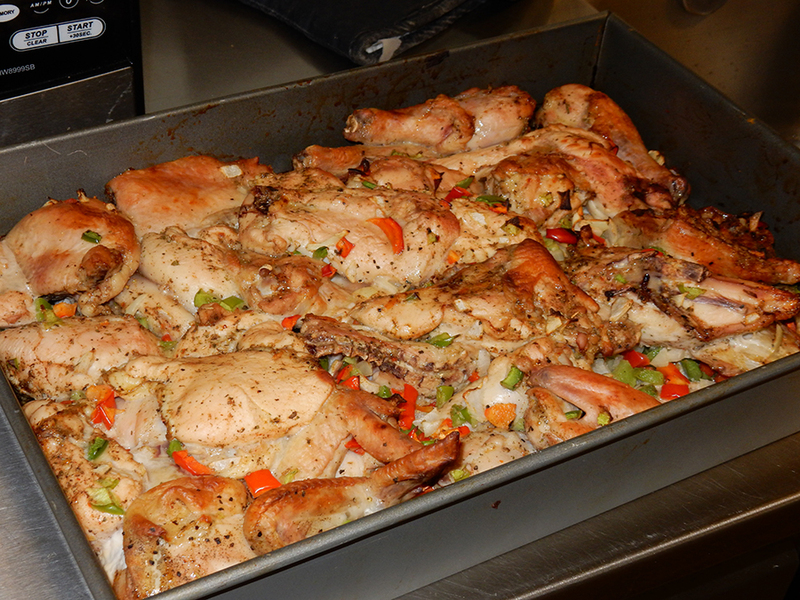 One evening at Calvary, Chef Barbara told everyone she was preparing a new baked chicken dish with a special sauce. “I bet you can’t tell me what you’re eating,” Barbara said. The chicken was a hit, but women had a hard time figuring out the secret ingredient. After several guesses, Chef Barbara filled them in: it was peanut butter! 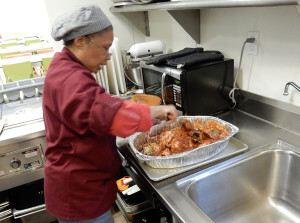 Chef Barbara works to keep the menu interesting in the Good Hope Kitchen. When she feels like things may be getting predictable, she experiments with recipes and tries unexpected ingredients, which is how peanut butter chicken was added to the menu. “I like to expose women to new foods because it makes them think a little differently,” she said. 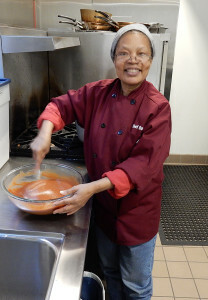 Peanut butter chicken is perfect served over noodles or rice, or Chef Barbara adds cubed potatoes into the mix. These portions are for a crowd, but can be reduced to make a delicious meal for one or two. 2. Dice the green peppers, red peppers and onions. 3. Combine chicken, peppers, onions and garlic cloves, and place in a deep pan. Bake at 350 degrees for one hour. 4. Meanwhile, combine tomato sauce, water, barbecue sauce and peanut butter in a large bowl. 5. Pour the peanut butter sauce over the chicken and bake for another 30-45 minutes, until a glaze forms.